Installing your own bimini top, cockpit cover, camper top, convertible top or other canvas boat top or enclosure? If you will be installing snaps on the canvas you order, you'll want our Professional Grade Canvas SNAP TOOL to make the process easier. 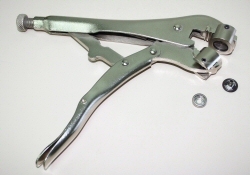 This heavy duty locking plier with adjustable tension sets cap and socket fasteners. We designed it ourselves after our own dissatisfaction with the performance and durability of the aftermarket tools available to our customers. Knowing the below terms may help your marine canvas project succeed. Call us if you need more help at 877-867-7861 or use the Find a Canvas Installer tool on the left to find a boat dealer or canvas shop near you for assistance. Arch: A structure mounted on the deck of a boat extending side to side over cockpit. Often used to mount radar units. Covers, tops and enclosures must be made especially to accommodate this structure and some attach to it using a valance. Awning track: Plastic or aluminum strips attached to arch or tower. Used to hold valance that supports canvas. Bows: (rhymes with "oh") “U” shaped tubular pieces that make up a top frame. Can be aluminum or stainless steel. Found in bimini tops, camper tops and sunshade tops. Cockpit: Open area of boat. Includes all seats, consoles and storage areas. Eye End: A top frame fitting on ends of tubing to allow connection to mounts or jaw slides. Used on any boat top with a frame. Fronts & Sockets: Components of snap. Used to attach canvas to boat. Gunnel: Top edge around the boat. Jaw slide: A top frame fitting that goes around the tubing to attach additional bows. Can be nylon, chrome or stainless steel. Mount: A fitting that attaches to the windshield, boat, or arch to which the top frame attaches. Found in bimini tops, camper tops and sunshade tops. Pull pin: Pin used to secure the eye end on the top frame to the mount. Is removed from mount to disconnect top frame. Screw stud: Screw with snap stud that attaches to the fiberglass of the boat. Used to attach canvas to boat. Slide track: A track that is screwed to the boat into which a top attaches. Top can then slide back and forth. Found in bimini tops and camper tops. Slider: Part to which mount is attached which allows mount to slide in track. Starboard: The right side of the boat when in the boat facing forward. Support poles: Tubing pieces used to support frames of bimini tops and sunshades. Can be aluminum or stainless steel. Wakeboard Tower: A structure on a boat, generally made from aluminum that raises the rope up for wakeboarding and to which racks are mounted to hold wakeboards. Boat covers, bimini topsand enclosures must be specifically designed to accommodate wakeboard towers. Twist Knob: A threaded knob used to attach eye ends to mounts or jaw slides. Valance: A strip of canvas that slides into a track on the radar arch with a zipper on the other side to attach a bimini top off the front of the arch or a sunshade top off the back of the arch. Windshield Clip: Rectangular clip that has snap stud. Clip snaps onto windshield. Allows for attachment of canvas.